CheckBox Control is used, when you want the user to select more than one option from the available choices. For example, the education of a person. A person can have a graduate degree, post graduate degree and a doctrate. In this case the user selects all the 3 checkboxes. Where as a person, may just have a graduate degree, in which case he only selects, the graduate checkbox. 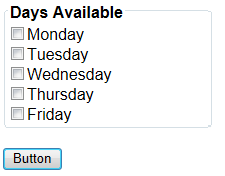 Another example, would be when you want the user to select the days of his availability. In short, if you want to provide the user with more than one option to select from, then choose a check box Control. Checked - This is a boolean property, that is used to check if the check box is checked or not. AutoPostBack - Set this property to true, if you want the webform to be posted immediately when the checked status of the check box changes. Focus() - Just like TextBox, checkbox also supports, Focus() method. If you want to set the input focus, to a specific checkbox, Call this method for that check box control. CheckedChanged - This event is fired when the checked status of the check button control is changed. <asp:CheckBox ID="GraduateCheckBox" Checked="true" Text="Graduate" runat="server"